At Russ & Daughters Cafe, expert smoked salmon slicers work their craft in front of guests; an open kitchen provides an over-the-counter connection like one feels in the store; a soda fountain bar beckons with homemade sodas, egg creams, shrubs, and superb cocktails; friendly staff proudly wear the iconic white Russ & Daughters lab coats; and 105 years of living history permeates throughout the entire space. Saturday, 4/20: 8am - 3pm. 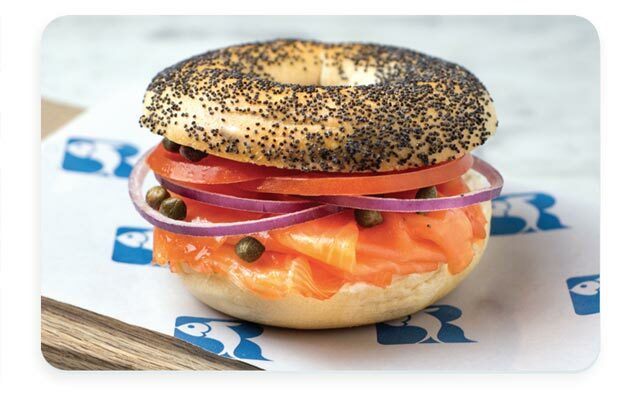 Russ & Daughters Cafe is neither kosher nor kosher for Passover. We are open regular hours all other days during Passover. Order for Delivery or Pick-Up after 5pm! HOUSE-MADE WITH WHITEFISH, PIKE, AND CARP. SERVED WITH FRESHLY-GRATED HORSERADISH. [Serves 3-4 people] With cream cheese, onion, tomato, capers, pickles, and Russ & Daughters bread basket. CUSTARD-LIKE EGG, CAVIAR, SERVED WITH CHALLAH. Caraway-infused vodka, rye croutons, pickled vegetables. Dill-infused vodka, fresh dill. Fenugreek-infused vodka, celery. Smoked Pepper-infused vodka, smoked salt. Seltzer with a selection of housemade syrups. Shrubs are the beverage equivalent to the process of pickling. Invented as a way to preserve fruit with vinegar, shrubs have been used to flavor drinks in America since the 18th century. A selection of fine spirits. 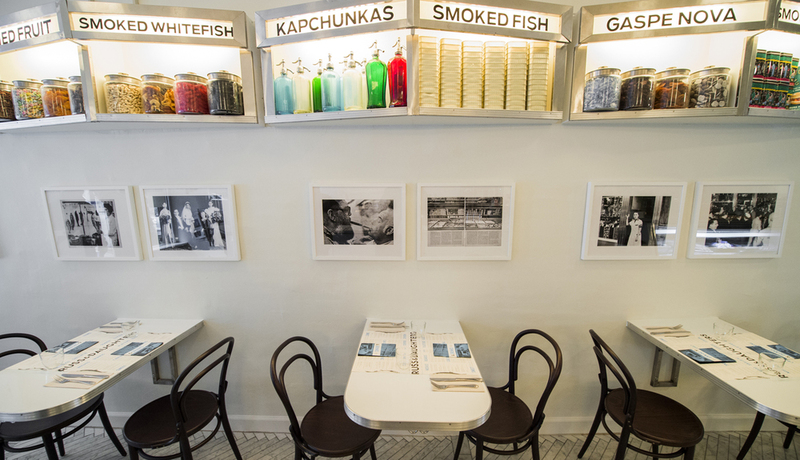 For over 100 years, Russ & Daughters — and now the Russ & Daughters Cafe — has been an integral part of the history of New York City, a touchstone in the lives of generations, and the torchbearer of Jewish food in America. In 1979, when the daughters and their husbands were ready to retire, Mark Russ Federman, Anne’s son, decided to leave his legal career and become the third generation owner. For thirty years, together with his wife, Maria, they ran Russ & Daughters and made it into a New York destination, despite the Lower East Side’s reputation in those years as a rough and tumble neighborhood. 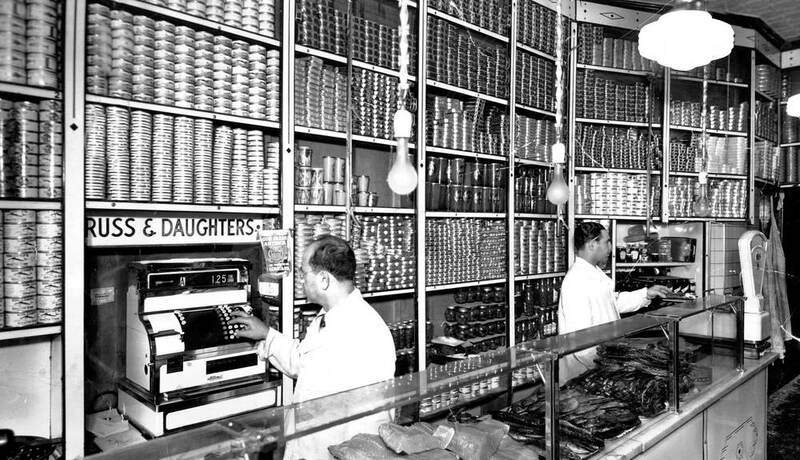 Mark Russ Federman wrote an acclaimed memoir, “Russ & Daughters: the House that Herring Built,” which vividly recounts the history of Russ & Daughters and his time running it. 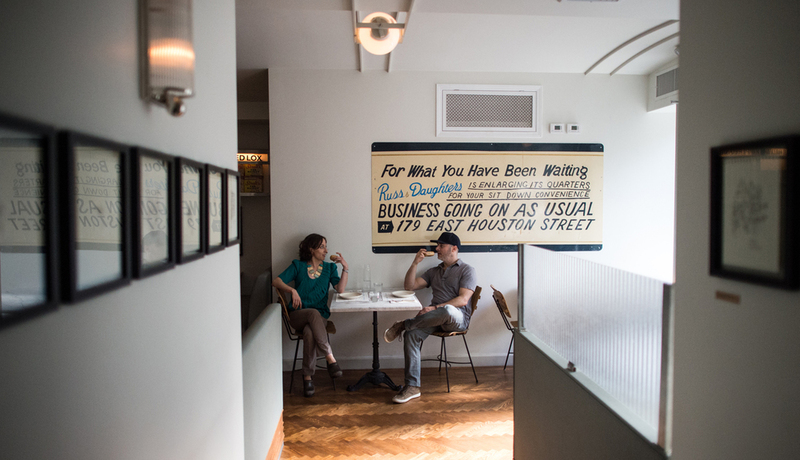 100 year later, on the very same street where Joel Russ first stood outside and sold his herrings out of a barrel, his great-grandchildren, Josh and Niki Russ, continued the legacy and opened the Russ & Daughters Cafe. 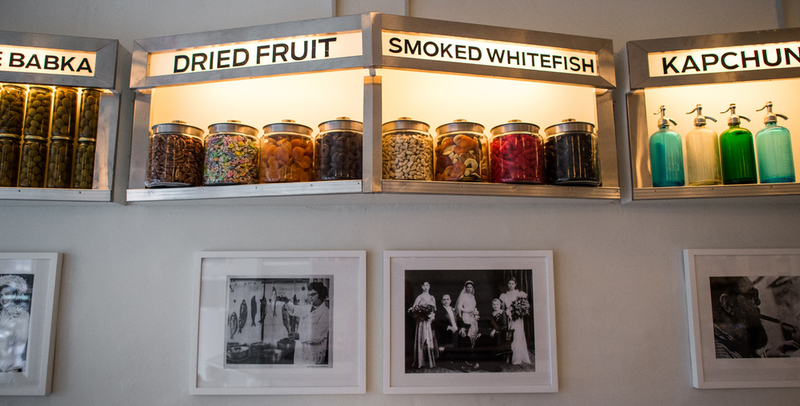 In 2015, after 101 years solely on the Lower East Side, Russ & Daughters expanded uptown with the opening of Russ & Daughters at the Jewish Museum. This location provides both the retail and restaurant experience to museum-goers and the general public alike. When Joel Russ started peddling herring from a pushcart, could he have imagined a time when the fourth generation of the Russ family would walk, daily, into a landmark appetizing shop and sit-down restaurant hailed by the Smithsonian Institute, the National Register of Historic Places, The New York Times, Gourmet, Bon Appetit, Martha Stewart, NPR, The New Yorker, New York Magazine, PBS, The Food Network, The Travel Channel, The New York Times Magazine, The Wall Street Journal, and Vogue — among many esteemed others — for its contribution to New York’s culinary and historical landscape? Russ & Daughters and the Russ & Daughters Cafe have received praise in countless national and international publications, and the cafe was recently named #2 on Pete Wells’s New York Times list of “The 10 Best New Restaurants of 2014.” Russ & Daughters has been featured in the PBS documentaries: The Jews of New York and The Sturgeon Queens – highlighting the contributions of multiple generations of the Russ family during the past century.